21 of 44 chapters in the United Nations’ Nobel-winning climate bible earned an F on a report card we are releasing today. 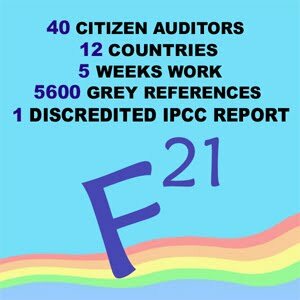 Forty citizen auditors from 12 countries examined 18,531 sources cited in the report – finding 5,587 to be not peer-reviewed. We’ve been told this report is the gold standard. We’ve been told it’s 100 percent peer-reviewed science. But thousands of sources cited by this report have not come within a mile of a scientific journal. Based on the grading system used in US schools, 21 chapters in the IPCC report receive an F (they cite peer-reviewed sources less than 60% of the time), 4 chapters get a D, and 6 get a C. There are also 5 Bs and 8 As. IPCC studies only peer-review science. Let someone publish the data in a decent credible publication. I am sure IPCC would then accept it, otherwise we can just throw it into the dustbin. This entry was posted on April 14, 2010 by Donna Laframboise in climate bible, IPCC, peer-review, Rajendra Pachauri and tagged climate bible, Intergovernmental Panel on Climate Change, IPCC, press releases, Rajendra Pachauri, report card.